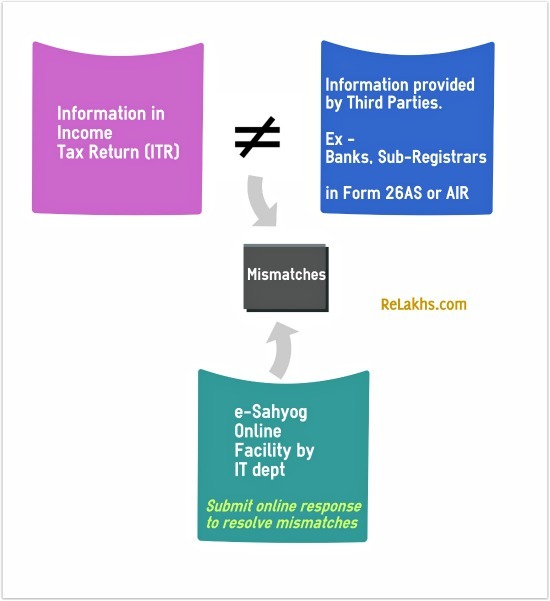 e-Sahyog : How to resolve Tax Return mismatches online? Do you know that your Income Tax Return (ITR) can be picked for ‘Scrutiny’ if the Income Tax Department detects a mismatch or discrepancy in your income, investments and expenses? The IT department receives third party data from Banks, Sub-Registrar offices, Service Tax Department, Other financial institutions, your employer etc., This data can be related to your TDS, income and investments. A mismatch can happen if this data do not match with the Income Tax Return that you have filed. Your AO (Assessing Officer) or IT dept system can randomly pick your case for scrutiny. In this scenario, you need to physically appear before the IT authorities and resolve the issue. For example; Mr x sells a property worth Rs 35 Lakh and reports this high value transaction erroneously in his ITR as Rs 25 Lakhs . The sub-registrar office reports this as Rs 35 Lakh transaction to the IT department through AIR (Annual Information Report). This leads to a ‘mismatch issue’. To avoid the need for the taxpayer to physically appear before tax authorities and to reduce the ‘compliance cost’ (especially for small tax payers), the Finance Minister Shri Arun Jaitley recently launched an “e-Sahyog” pilot project. The objective of “e-Sahyog” is to provide an online mechanism to resolve mismatches in Income-tax returns of those assesses whose returns have been selected for scrutiny, without visiting the Income Tax Office. Under this initiative the Department will provide an end to end e-service using SMS, e-mails to inform the tax assesses of the mismatch. You simply need to visit the e-filing portal and log in with your user-ID and password to view mismatch related information and submit online response on the issue. The response(s) submitted online by you will be processed and if the response and other information are found satisfactory as per automated closure rules, the issue will be treated as closed. You can also check the updated status by logging in to the e-filing portal. Transfer of property reported in AIR by third party but capital gains are not declared by you in your Return of Income. This mismatch can occur when your ITR (ITR 1 or ITR 4S) does not contain details of any ‘transfer of property’ while the IT dept receives the details about transfer of property from sub-registrar of the properties by way of AIR return. The value of property transferred as reported in AIR is higher than the value of property transferred as reported in your Return of Income. The Payment of compensation on acquisition of immovable property as shown in TDS return filed by acquirer is more than sale consideration reported in the Return of Income filed by you. The Payment of compensation on acquisition of immovable property is shown in TDS return filed by Government but capital gains are not declared in Return of Income. The amount paid/credited as per Form 26 AS (194C and/or 194J) but no income from business/profession declared in Return of Income. The amount paid/credited as per Form 26 AS (Section 194C and 194J) is more than the gross turnover or gross receipts shown in Return of Income. The amount paid/credited reported in Form 26 AS (Section 194I) is significantly more as compared to the income from your house property as shown in Return of Income. The amount paid/credited in Form 26 AS (Section 194I) is significantly more as compared to the rental value as shown in Return of Income. The amount paid/credited as interest and winnings from lottery, crossword puzzle, races etc. in Form 26 AS is more than the Income from other sources shown in Return of Income. The amount paid/credited as interest in Form 26 AS is more than the interest income shown in Return of Income. Higher turnover reported in Service Tax Return as compared to gross turnover or gross receipts reported in Return of Income. How to access e-Sahyog link? (or) How to view information related to mismatch? If the IT department finds a mismatch(es) in your ITR, they will inform you about this through SMS / email / letter. You can view the details about the mismatch and can submit your ‘response’ by visiting e-filing portal. Click on ‘My Pending Action’ on the home page dashboard. Under e-Sahyog tab, you can view information and summary about the mismatch. Click on ‘Response’ to submit online response. 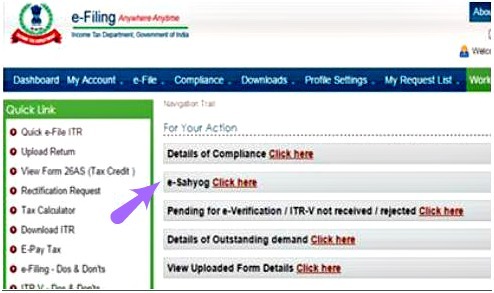 How to submit or respond to Income Tax Return Information Mismatch online through e-Sahyog link? Click on ‘Response’ to open ‘Return Mismatch Response’ window. 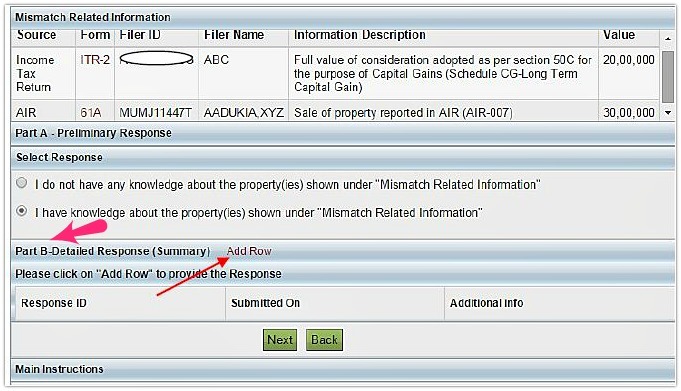 The mismatch related information (relevant value in the ITR and third party information) will be displayed in “Return Mismatch Response”. 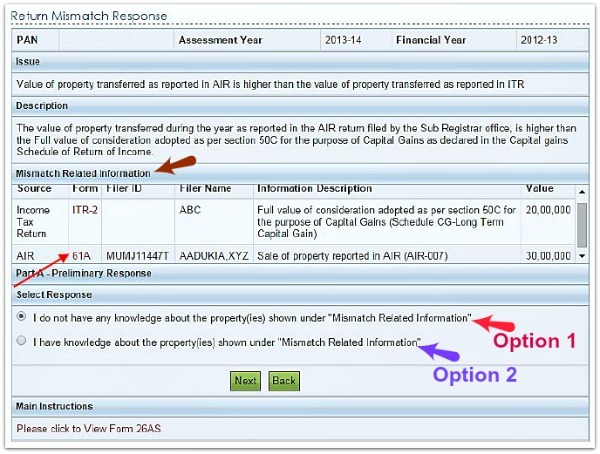 Under ‘mismatch related information’ (as highlighted in the below image), the first row provides information about the data value pertaining to your ITR. Whereas, the second row has third party’s information. For example : As indicated in the below image, tax assessee has provided information about Rs 20 Lakh property transaction in his ITR. But, sub-registrar office has mentioned the property value as Rs 30 Lakh in their AIR which is submitted to the IT department. This is a classic example for a mismatch. You (tax assessee) will be given two options under Part-A of Preliminary Response section. Click on Option-1, if you do not have knowledge about the mismatch (or) Click on Option-2 if you have knowledge and information about the mismatch. If option-1 is your selection, click on ‘Next’ and submit your response. If option-2 is your selection, you have to submit detailed response under ‘Part-B‘. After providing detailed summary, click on ‘Next’ and submit online response. You can take a printout of the response. In case if you have multiple mismatch issues, the response already submitted will appear in blue colour and the remaining ones will appear in red colour. The response(s) submitted by you will be processed and if the response and other information are found satisfactory as per automated closure rules, the issue will be treated as closed. You can also check the updated status by logging in to the e-filing portal. I believe that this initiative of the IT Department is expected to significantly reduce the burden of compliance on small taxpayers and enhance the taxpayers’ satisfaction. Have you used e-Sahyog online facility to resolve any mismatch issue? Do you think that e-Sahyog facility is useful for small tax payers? Kindly share your views. I am an nri and have time deposit with bank.Last week I got a complaint notice from IT dept regarding non filing of return. When I view the complaint it regarding to the time deposits. When bank file it’s return, my deposit details in AIR entered. In this case what response is made? My 21 days response period already over. What I do? While submitting the response I want to select the 2nd option, then further details are not liable for me. 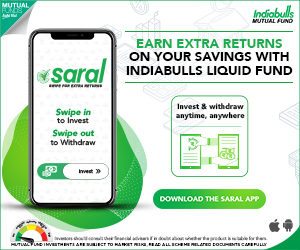 Whether 1st column to be selected and mention the time deposit amount. In the remarks column can I tell that it’s NRE deposits and not liable to tax. Is it ok or whether any corrections to be made? * How to reply to Non-Filing of Income Tax Return Notice? * What is Double Taxation Avoidance Agreement (DTAA)? 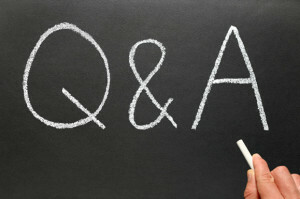 | Is Income earned outside India Taxable? Also, suggest you to kindly consult a Chartered Accountant ASAP. 2) How many times I can give gift to him. Is there compulsion to do a gift deed. 3) On Receiving gift can he invest in FD , Shares, Bonds . First Name his & can I B the 2nd Holder . 1 – No ceiling limit as such. 2 – Gift deed can be considered if it is a huge sum or for immovable assets. 4 – Clubbing of income is not applicable. I cannot see any timeline by which I need to solve my pending action. Is there any deadline for this. I just started seeing Pending action item couple of days back. Dear Saurabh ..May I know what is has been listed as Pending Action ?? Is there a way to check AIR? I have check 26AS, but it always show “no transection record” in AIR section. I am worried about because I have bought few stock in feb. 2016 and sold them in july 2016. But I didnt involve this stock information in IT return because my CA told me that return can be file only for profit and loss. Do income tax department will get intimation this year? Or they will wait for next financial year income tax return. As said by your CA, you can disclose Gains or Losses when filing your ITR for AY 2017-18. In my form 26AS shows sec 194C income but by mistake i have filed ITR 1 (sahaj) insted of ITR4s for A.Y 2014-15 now in income tax – my pending actions – E-sahyog shows mistach isssue,, how to response E-sahyog in option 1 or 2? or will I file again revised ITR4s for rectify this mistake for A.Y 14-15? You can file Revised return and can submit this information by opting the second option (as you have the information abut the mis-match). Suggest you to consult a CA. AIR shows sale of property of Rs 38,00,000/-. However there is also purchase of property of Rs 47,00,000/-, hence there is no gain. however disclosure of both the property was not made in ITR. How to respond to mismatch? You can select ‘ I have knowledge about the properties shown under mismatch…’ option under e-Sahyog link, and provide all the details that you know and submit your response. During filling of AIR response, I see we need to fill the TAN of sub-registrar where the buyer and seller had to register for sale of flat. How could I get the TAN of sub-registrar? Was the transaction value > Rs 50 Lakh? Did you pay any TDS on the transaction? No The value was less than 50 lakh, infact its 34.5lakh. Dear Mithun..Kindly take help of a CA. e-sahyog option is not available in my income tax website login though I have an oustanding demand notice available in my profile. Is that facility still not launched or available for limited users? Please share your though on this. Did you receive any sms or email regarding the ITR mismatch and asking you to use e-Sahyog facility? Under which section did you receive the notice?